Rheum x cultorum. Polygonaceae. A leafy perennial grown for its thick succulent petioles, rhubarb is probably a hybrid of Rheum rhaponticum and Rheum palmatum; its origins are unclear. However, the two parents and other species of Rheum are grown in China and other parts of the East; Rheum officinale and Rheum palmatum were described in a Chinese herbal of 2700 BC – they were used for their strong laxative properties. 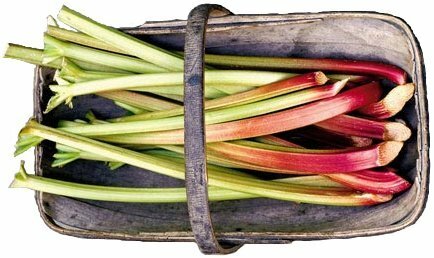 Many of these species were articles of commerce from the Far and Near East and gradually came into European cultivation; the culinary use of rhubarb in Europe dates from the 18th century. The crop is more frequently cultivated in temperate regions, but cultivars have been selected for high elevations in tropical areas. With shortening daylength in autumn, rhubarb becomes dormant and leaf production is only resumed following exposure to low temperatures for a period which varies in length between cultivars. Those requiring the shortest cold treatment to break dormancy will produce the earliest crops in the following spring when temperatures begin to rise. Harvesting takes place during the spring and early summer but plants can be forced to produce an early crop of blanched petioles during late winter. Only the petioles are edible and leaves must on no account be eaten as they contain a poisonous glycoside. Both blanched and natural petioles may be cooked by boiling or baked in pies and tarts, sugar usually being necessary to reduce acidity. Under favourable conditions plants may extend to almost 2m across and hence need a fairly large open site. The crop will grow well on almost any soil type provided drainage is good. The crop has a high demand for water and the incorporation of organic matter to improve soil moisture retention is recommended. The crop is likely to remain on the same site for a number of years so it is important to plant in an area clear of perennial weeds. Although tolerant of acid conditions, growth is optimal in the pH range 6.5-7.0. The soil should be deeply cultivated, incorporating farm-yard manure or compost. If necessary drainage can be improved by planting into raised beds or ridges. 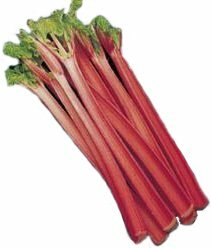 Rhubarb is propagated by division of the crown into pieces each having at least one good bud. A new planting should only be started from vigorous healthy mother plants of named cultivars. Crowns should be divided and planted during the dormant phase, late autumn being the best time. Sections of the old crown should be planted 75-90cm apart with the buds just showing at the soil surface. Propagation from seed is not recommended as the resulting plants are likely to be variable and high quality cannot be guaranteed. Plants should be kept well watered and free from weeds, particularly during their establishment period. Flowering stems should be removed as they weaken the plant. Harvesting should not be carried out during the first growing season to enable crowns to develop and build up reserves. In subsequent seasons harvesting can be carried out as required by pulling petioles upwards so that they separate from the crown cleanly without snapping. Always retain three or four leaves per plant to sustain the crown. Depending on their vigour, plants should be lifted and crowns divided after about five years to prevent the devopment of a high proprotion of smaller leaves and thin petioles. Early harvests can be obtained by forcing plants, either by covering with a thick layer of straw during mid winter or by covering individual crowns with a rhubarb pot or similar cover to provide protection and to exclude light, thus blanching the developing leaves. Crowns can also be lifted during autumn and early winter and forced under protection in a greenhouse or shed. They must however, first be exposed to low temperatures in order to break their dormancy. Unless the weather has already been cold the roots should be left exposed on the soil surface to frost. The roots should ideally be frozen solid, but a few severe frosts will usually suffice. Crowns should then be replanted in large pots or boxes and brought indoors, when regrowth will be resumed at temperatures between 7-16ºC. The developing petioles can be blanched at the same time by excluding light with, for example, black plastic. Plants forced in situ will take some time to recover and are best left uncropped during the following season. Those forced indoors are best discarded. 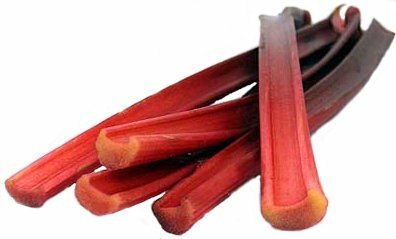 Rhubarb cultivars differ in flavour and their season of production, the early ones being the most suitable for forcing. Recommended cultivars include: (early) ‘Early Red’, ‘Champagne Early’, ‘Glaskins Perpetual’, ‘Hawkes Champagne’, ‘Timperley Early’; (mid season) ‘Prince Albert’, ‘Canada Red’, ‘MacDonald’; (late) ‘The Sutton’, ‘Victoria’. Notable US cultivars are ‘Linnaeus’, ‘Martha Washington’ and ‘Oregon Red Giant’. Rhubarb is susceptible to armillaria root rot and crown rot.